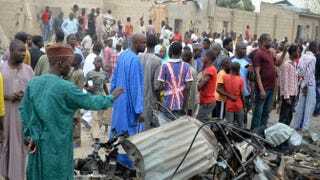 People look at the damages on March 2, 2014, after two explosions went off in a crowded neighborhood of Nigeria’s northeastern city of Maiduguri, a stronghold of Boko Haram Islamists in Nigeria. Boko Haram insurgents—the jihadist terrorist group in Nigeria that gained international notoriety for abducting more than 200 schoolgirls in April—is gaining ground in Nigeria. They’re hoping to establish an Islamic state in the regions that they’ve captured, much as ISIS (the Islamic State of Iraq and Syria) is trying to do in Syria and Iraq. “Experts raised concerns that Nigeria, Africa’s most populous country, could break up in a way similar to Iraq and Syria where the militant group Islamic State (IS) has declared a caliphate,” the BBC is reporting. It is predicted that President Barack Obama will give a speech on Wednesday backpedaling on his initial thoughts that eradicating ISIS would be a fairly easy mission. Nigeria’s military forces are experiencing a similar blow after losing an offensive battle to insurgents on Monday. Boko Haram shot and wounded Lt. Col. Adeboye Obasanjo, the son of former Nigerian President Olusegun Obasanjo. Lt. Col. Obasanjo was fighting alongside Nigerian government forces that are trying to recapture towns that Boko Haram has seized in northeastern Nigeria. “Thousands of people are fleeing northern parts of Adamawa state where Boko Haram insurgents maintain a firm control of four towns—Madagali, Gulak, Michika and Bazza—and many surrounding villages,” the BBC reports. All eyes are on a town called Mubi, one of Nigeria’s commercial hubs, since Boko Haram insurgents successfully captured Michika and Bazza, two towns near Mubi. The Nigerian military is switching up its tactics and will intensify its air attacks to put a stop to Boko Haram’s advances.